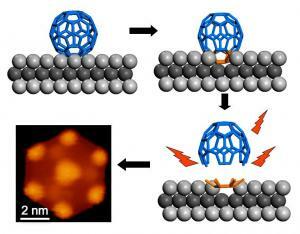 Researchers from Singapore discovered that graphene quantum dots can be made from carbon-60 molecules (C60, known as buckyballs). This is the first "bottom-up" approach to make graphene quantum dots - which could lead to more efficient and cheaper designs. The QDs are smaller then 10nm in size and are all in the same size and shape. The idea is to decompose C60 molecules at high temperatures on a ruthenium metal surface. The metal acts as a catalyst and causes the C60 to break down into carbon clusters. The researchers were able to limit cluster aggregation and at around 825K temperature the clusters merged and crystallized into hexagonal-shaped graphene QDs.